The best beachfront hotels in Nusa Dua Beach include most of the five-star luxury resorts that grace this south-eastern-lying upscale resort area in Bali. We’ve selected those that welcome you to a pleasurable stay, with their great combination of services and facilities, while allowing you direct access to the gorgeous and quiet stretch of white sand beyond well-manicured gardens and water features. 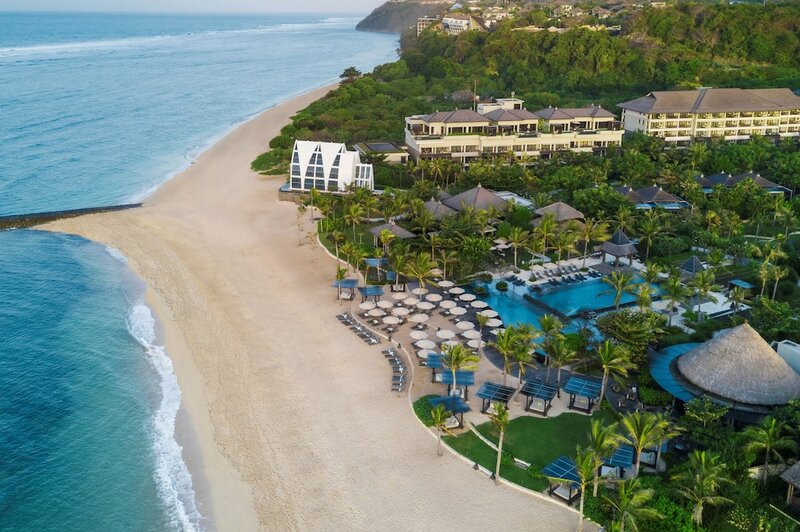 Some of these great hotels right on the beach of Nusa Dua also feature world-class dining venues, with backdrops of the island’s tallest peak, Mount Agung, and the outline of Nusa Penida island beyond the waves. Mornings on the coast are blessed with dramatic sunrises, and throughout the day at any of these best beachfront hotels in Nusa Dua Beach, you’ll enjoy from lazing with a good read on the sand, or having some fun thrills with a host of marine activities available.